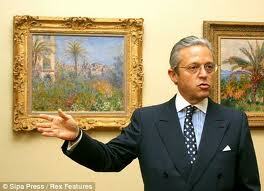 Daniel Wildenstein has been dead for ten years but the battle over his fortune continues. Wildenstein headed Wildenstein and Company, a large conglomerate of galleries in locations throughout the world. He was a noted scholar who compiled the catalogues raisonnés of many noted impressionists. Works by artists such as Monet, Manet and Gauguin are often referred to by their Wildenstein index number. When he died in 2001 after complications from surgery, his immense fortune went to his sons Alec (now deceased) and Guy along with his widow Sylvia Roth. After her husband died, Sylvia began to accuse the sons of hiding Wildenstein wealth in order to cheat her out of her inheritance and to evade taxes. Sylvia Roth died last November but the lawsuit refused to die with her. In accordance to her wishes, he lawyer continues to pursue the case. While investigating the Roth lawsuit, a French anti-fraud unit searched a Wildenstein warehouse. What they found shocked them. Inside a storeroom in the non-profit Wildenstein Institute, they found thirty paintings that were reported stolen over the years. Many of the pieces were reported stolen by Jewish families whose art was seized by the Nazis. As a result of this find, French authorities have charged Guy Wildenstein concealment and breach of trust. When questioned about the pieces last April, Wildenstein told authorities they must have been an oversight error. Three months later, it appears that excuse failed to appease them.